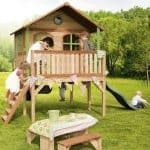 This exceptionally beautiful looking playhouse guarantees some really happy children or grandchildren! 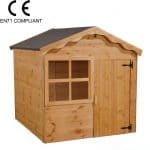 It is made out of strong and durable tongue & groove shiplap cladding and has one fixed window and three styrene functional windows plus a handsome looking cottage style door and it even has a second floor – hence the name “Loft Playhouse”. There are even pretty little shutters and a sloping roof. Inside there is a ladder so the kids can climb up to the loft room. They won’t want to come back inside the main house! This product comes home delivered and assembled for your convenience. 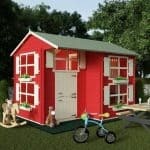 My is in love with his new hire loft playhouse. I can’t get him to stop playing in it! 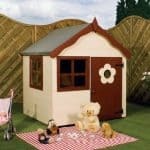 He likes to have his friends over and they stay all day in the playhouse. I like it because it I spacious so there is no fighting over who get to play in it. 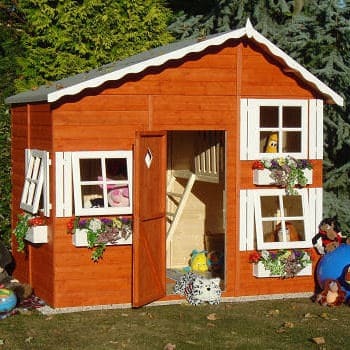 I have had playhouse before that were too mall and the kids had to take turns, and they didn’t like that very well. My son was having a birthday party soon, and I was going to get him a playhouse anyway. 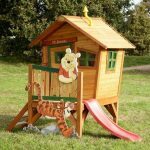 However, I decided to give him the playhouse sooner so him and his friends could play in it. 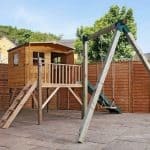 They had a great time and it made me happy that I decided to put the playhouse up before the birthday party.